Zoom: The Zoom feature enlarges the contents displayed on the iPad screen when you double-tap the screen with three fingers. The Zoom feature works almost everywhere in iPad: in Photos, on web pages, on your Home screens, in your Mail, in Music, and in Videos — give it a try! Invert Colors: The Invert Colors setting reverses colors on your screen so that white backgrounds are black and black text is white. The Invert Colors feature works well in some places and not so well in others. For example, in the Photos application, pictures appear almost as photo negatives. Your Home screen image will likewise look a bit strange. And don’t even think of playing a video with this feature turned on! However, if you need help reading text, Invert Colors can be useful in several applications. Turn On Larger Type: If having larger text in apps such as Contacts, Mail, and Notes would be helpful to you, you can turn on the Larger Type feature and choose the text size that works best for you. Bold Text: Turning on this new setting will first restart your iPad (after asking you for permission to do so) and then cause text in various apps and in Settings to be bold. This is a handy setting as text in the iOS 7 redesign was simplified, meaning thinner! Increase Contrast: Use this new setting to set up backgrounds in some areas of iPad and apps with greater contrast, which should improve visibility. 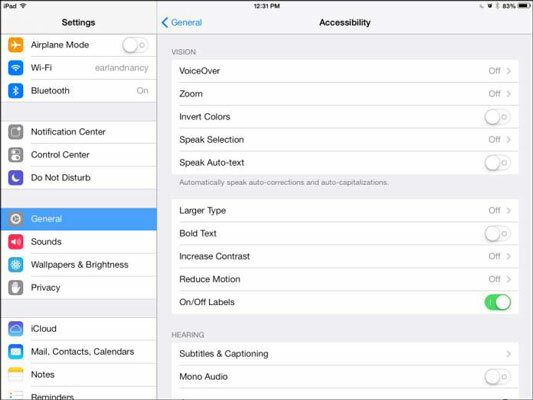 Reduce Motion: Tap this new accessibility feature and then tap the On/Off setting to turn off the parallax effect, new with iOS 7, which causes the background of your home screens to appear to float as you move the phone around. Manage On/Off Labels: If you have trouble making out colors, and so have trouble telling when an On/Off setting is On (green) and Off (white), use the new On/Off Labels setting to add a circle to the right of a setting when it’s off and a white vertical line to a setting when it’s on (see the figure).